July 27, 2012 By Jayden Quinlan & filed under All Articles, Shooting Drills, Tactics/Training. While deeply involved in reading one day, my phone rang unbeknownst to me. When I reached a stopping point in the reading, almost as though recalling a dream, I thought I had heard the phone ring. I confirmed that it had and the ring volume was at a level I should have heard. My mind started to go into overdrive. First I had to acknowledge the irony that reading a book about defensive handgun scenarios was what had put me into a totally oblivious state. 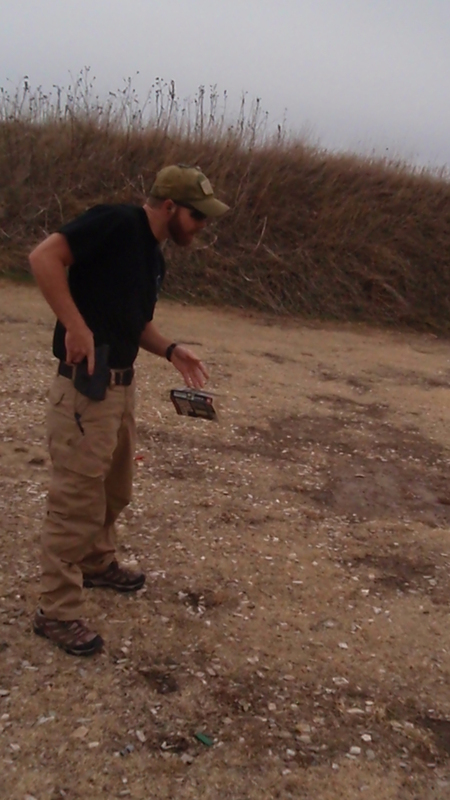 But now it put me into a creative state of mind to break ground on a new defensive handgun drill. Instructor’s “cheat sheet” for Reading Drill. The realistic portion of the population, which acknowledges that we don’t live in a perfectly peaceful world and that boogeymen do indeed exist, has a higher level of situational awareness than most people. Let’s face it, though, aspects of everyday life draw our attention so acutely that we can lose part or all of our situational awareness. This poses a complex problem, because the threat can come at any time, any place and in many different ways. Life wouldn’t be livable being completely paranoid, and having a personal law enforcement officer isn’t realistic, so we educate ourselves and train in the principles to deal with threats wherever they may pop up in life. On the range though, how accurate are our training methods for those moments of complete loss of situational awareness? Following instructor’s commands, shooter searches for the page and begins to read aloud. 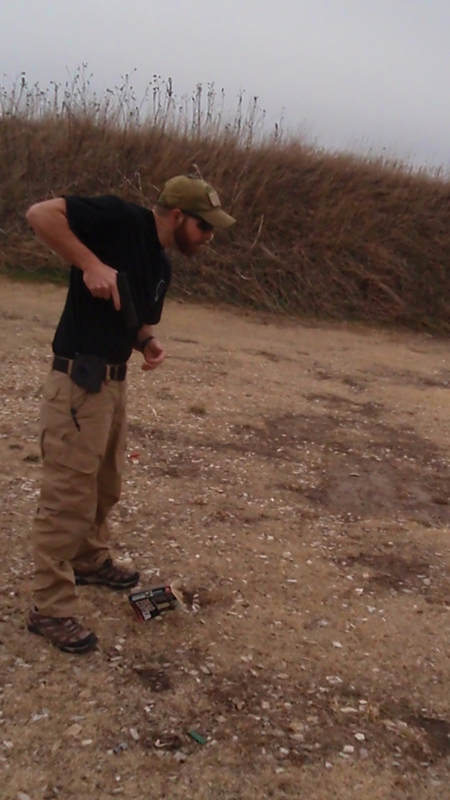 Downward position of head and hat brim prevent shooter from peeking at target setup. When you go to the range, you know you’re going to shoot. When you set up a target, you know you’re going to shoot that target. Waiting for a buzzer or command to shoot usually breeds low confusion, but more so an anticipation of when to shoot. These are for the most part all known things to the shooter, but in the real world it’s how we react to the unknowns that ultimately count. How does reading correlate to more realistic training? Reading is a complex activity that requires a lot of attention to perform properly, especially reading aloud. When reading aloud, the eyes have to see the word and send it to the brain. The brain recognizes the word and sends it to the vocal cords, where it is pronounced. When the word is spoken, the ears hear it. If the ears don’t like it, they send it back for another try, and then if it’s good, the eyes shift to the next word. All of this takes place in a very short amount of time for a reader of average proficiency. Try watching or just listening to the TV and reading a book at the same time while comprehending both, and you’ll find it’s nearly impossible to concentrate on both at the same time. My hypothesis was that if I took a shooter and had him read aloud before I randomly called out a target or threat, it would call for a major shift in attention from reading to dealing with the new immediate threat situation. After guinea pigging some shooters, I was impressed with the results. Head rises as firing grip is quickly acquired. With a target placed in front of the shooter with circles randomly numbered one to six, I administered my epiphany. The shooter held a closed book in both hands with the handgun holstered. Calling out a random page number, the shooter first had to concentrate on finding the correct page. Upon finding the page, he immediately began to read aloud. Then at random, I would call out a target number—sometimes as soon as he started, sometimes after he’d completed nearly a whole page. When the target was called, the shooter had to drop the book and deal with the threat. I’m not a fan of hypocrites, so after the shooters got a feel for how it worked, I had them administer it to me. I found the same results as the shooter I had tested. While standing in front of the target, I knew I was about to shoot, and I knew what area I was going to shoot in. As soon as the page number was called, my attention left those facts for the task at hand. Once the reading begins and your attention is away from the anticipation of the threat, you begin to almost relax into the reading. Then, out of nowhere, a threat “presents” itself. Your entire thought process has to change on a dime from processing the next word to making a split-second assessment of what is going on, identify the threat and engage it. In all the training and drills I’ve done, I’ve had, to varying degrees, some stage of anticipation. I knew to some extent what was going to happen and was just waiting for the gate to open. In the reading drill, you know what is going to happen, but you can’t just wait for it to happen because you won’t be able to read aloud. Pistol clears the holster with the trigger finger straight along the frame—a good demonstration of safe principles under pressure. To enhance the drill, I replaced the numbered circles in new locations without the shooter knowing and administered it again, making him search for the target and increasing the difficulty. In an attempt to further challenge the shooter and add emotion to the drill, I randomly changed the page number as soon as he started to read. “Page 83… no, 47… no, 150… threat! !” Changing page numbers not only confused and frustrated the shooter, but prevents any anticipation. If no switch of page numbers is used, the shooter is told a page number and starts reading. The brain knows that the next sound from the instructor’s mouth is going to be a threat or the target designator, and he can anticipate it even while reading, though not as much as in traditional drills. Changing pages prevents this, as the next word from the instructor could be a threat or a new page to read. Calling out target numbers that weren’t even present really sent the shooter for a loop. Having targets one to six and calling out target seven in most cases saw the shooter unholster, punch out, and then realize there was no target seven. Numbered targets were used in the test drill because they were available on the spur of the moment. The use of realistic shoot/no shoot targets would greatly enhance the drill by only using the command “threat” without the shooter knowing the location of the targets. In this way, the shooter has to assess what the threat is before engaging—if there is a threat at all. This is one of the more critical skills for the home-defense minded or responsible CCW holder. First shot is fired as book comes to rest. 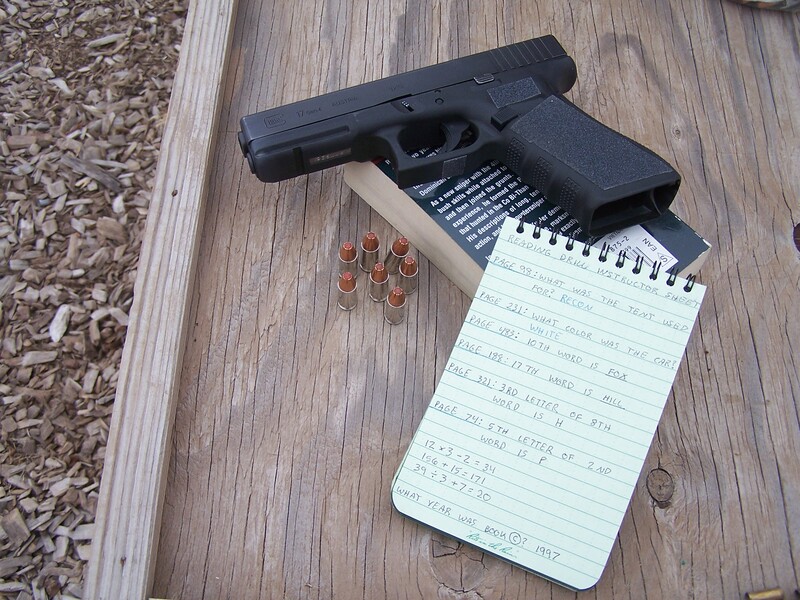 The flexibility of the drill is endless, as I occasionally throw in a mental math problem in mid page or make the shooter start on the 15th or 21st word on the page. The more attention that is drawn from the shooter to the task at hand, the less they can anticipate. I will say, I received some very perplexing looks from other shooters at the range while administering this to my test shooters. The few who were brave enough to ask questions wanted to try it themselves after I explained it to them. As strange as it may seem to onlookers, conducting the drill will prove its effectiveness and outweigh the unorthodox method. 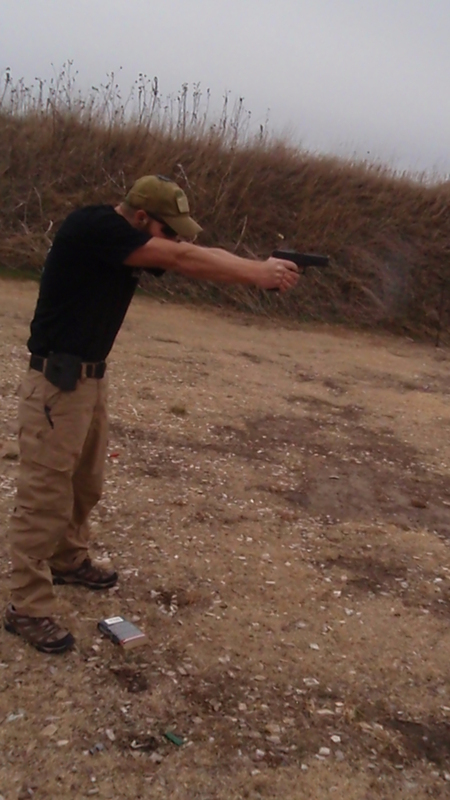 Running the same old familiar drills can allow the shooter to become comfortable while training for something that in reality is not comfortable at all. Training out of the comfort zone is as close to reality as training allows. 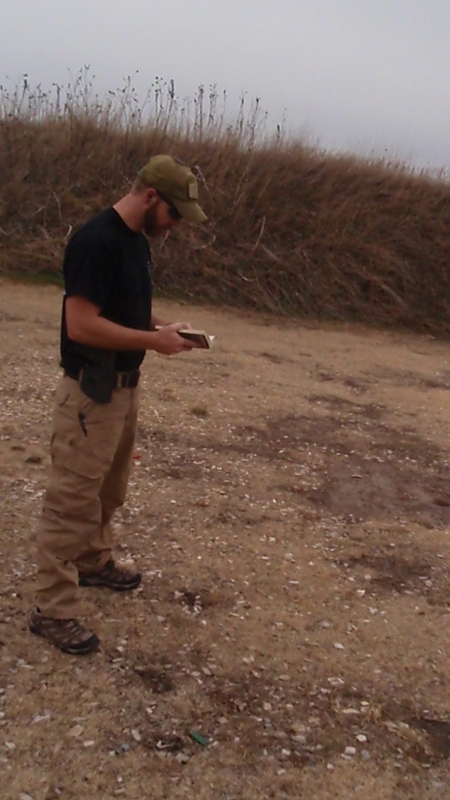 If you’re tired of running the same old drills, can’t afford a pop-up target system, or don’t have access to a kill house, what I have coined The Reading Drill may be a book worth putting your nose in. Jayden Quinlan is a former Navy small arms and martial arts instructor. He is currently working in research and development for a major American ammunition manufacturer.